Myklas Music Press was highly regarded for its extensive catalogue of quality elementary and intermediate supplemental piano music. 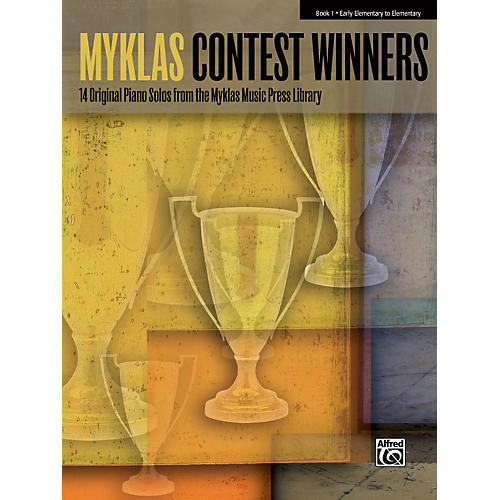 The pieces that are included in Myklas Contest Winners represent Myklass most popular and effective solos drawn from festival and contest lists. Divided into four graded collections, outstanding and time-tested solos are made available again by Rhonda Bennett, Ronald Bennett, Rosemary Barrett Byers, Lynne Cox, Anne Shannon Demarest, Mary Hauber, Ernest Kramer, Joyce Schatz Pease, Ruth Perdew, John Robert Poe, Catherine Rollin, Mike Springer, Robert D. Vandall, and Judy East Wells. Book 1 includes pieces appropriate for early elementary to elementary students. Reading range is limited and coordination between the hands is simple. Titles: Bubble Blues * Clown Serenade * The Crab * The Lion Roars * Marching Tune * The Minnow * Monkey Blues * Now You See Him, Now You Don't! * Pandas on Parade * Rain Forest * Trumpet Fanfare * The Whale * Who Has Seen the Wind? * Windflowers.